In the Netherlands, 6,648 shares in one wind turbine have just been sold to 1700 citizens in just 13 hours. The crowdfunded shares were 200 euros each, which made over 1.3 million euros in total for the project. 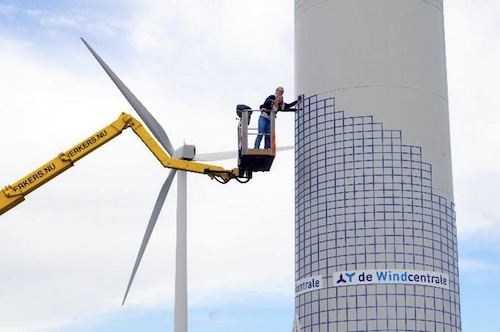 Windcentrale, a new dutch company that organizes cooperative wind turbine purchases, was responsible for the crowdfunding project. So far, Windcentrale says it has enabled nearly 7,000 people to buy shares in wind turbines, with thousands of others expressing interest in future wind turbine share opportunities. The company started-up its wind turbine purchasing program just last year. It began by selling shares in two wind turbines, which took 4.5 months to sell 20,000 shares. This time, selling 6,648 shares only took 13 hours, so it really seems to be catching on quickly. Co-founder Harm Reitsma has said that the uptake “shows that people really want renewable energy”. Each wind turbine is set up as a cooperative, with a separate contract with wind turbine maker Vestas. The electricity produced by the turbine will be sold through 10-year-old energy company Greenchoice, which has 350,000 customers. Through a smartphone app, participants will be able to monitor wind speeds and electricity production in real time. Do you this kind of crowdfunded cooperative could become a sizeable part of the future of renewable energy? It’s seems clear from the fast success that it’s possible. In fact, it’s being claimed that this latest project has set a new world record for crowdfunding. Even if that turns out not to be entirely accurate, it still shows there’s massive support for renewable energy projects to be funded in this way. What a brilliant and innovative way of funding. I imagine the real benefits will be with people considering similar ideas for other projects. The whole crowdfunding style is just getting started.